Britain’s biggest rally event is set for August. What has been termed as the Festival of the International Six Days Enduro is in fact a celebration of the hundred year history of the ISDT/ISDE. It will be the most important event in the UK off road rally calendar in 2013. Touratech the World’s largest manufacturer of Adventure Touring equipment is backing the event and will be present at the Carlisle start and finish area. 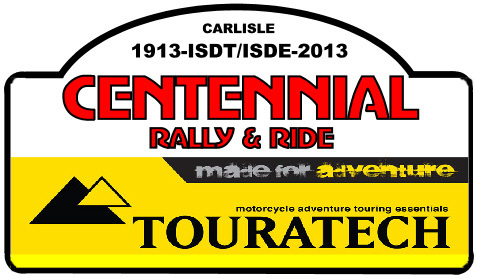 The first ISDT, later changed to the ISDE, was held in Carlisle in August 1913, one hundred years later Carlisle welcomes rally competitors to the city centre start area for a four day event. There will be a three day forestry rally in the Kielder & Kershope forests with each day starting and finishing at Carlisle Castle. A celebration programme is being produced by Carlisle City Council which has recognised the importance of this event. On the last day, which is exactly the same day of the month as the first day of the first ISDT, one hundred riders will ride the same course as the original first day. The Centennial Ride competitors will have lunch at Keswick where the old timers dined. The Centennial Rally has classes for adventure, genuine trail, sports and classic ISDT/E type bikes. The course will be three days of forestry tracks, two days of which will be three laps of a challenging course, the other day will be a single one hundred mile lap, the longest rally lap in Britain. Total distance is around four hundred miles. The Centennial Ride which follows the original one hundred and twenty mile gravel roads, now surfaced, will include machines and riders that have a connection with the history of the ISDT/E. No celebration of this type would be complete without a get together and this will take place on the Saturday evening at the Swallow Lynton Hotel, where bargain price accommodation is available, the hotel is a short distance from the start and finish area. There will be plenty to see near the start and finish arch where manufacturers and traders will have displays of their latest products. Further information is available at www.bigbikerallychallenge.co.uk where the regulations and entry form will shortly be posted. Go to touratechuk.co.uk for information or to request a catalogue. 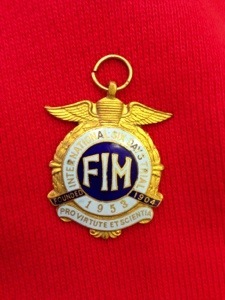 Common knowledge recognises that with a long involvement with the ISDT and ISDE including its founding in 1913 at an event in Carlisle Britain has won the International Trophy the most of any nation. 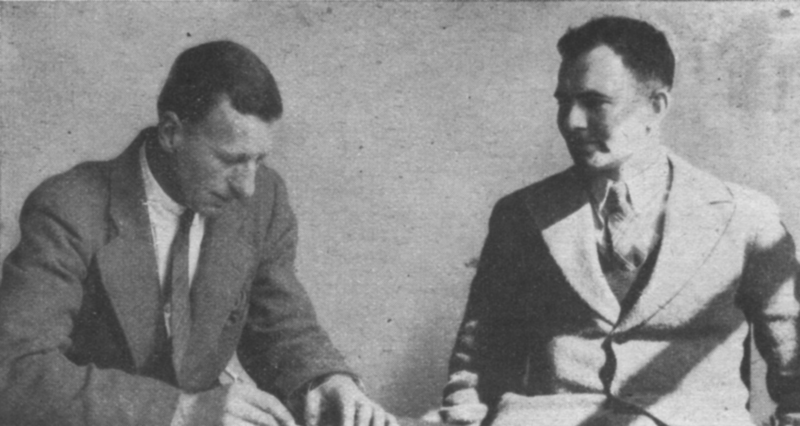 However it is popular belief, held with some disappointment in Britain, that the last time Britain won the Trophy was way back in the ISDT 1953 held in Czechoslovakia. The following year they lost it in Wales, handing the Trophy back to the hosts of their victorious event in the previous year. However a question remains that was ’53 the last year. Many at the time held out the vbiew that Britain should squeeze an extra year of glory if the decision of the Jury about an accident on the route had not reinstated a Czechoslovakian rider, who many felt should have been excluded for breaching the rules. 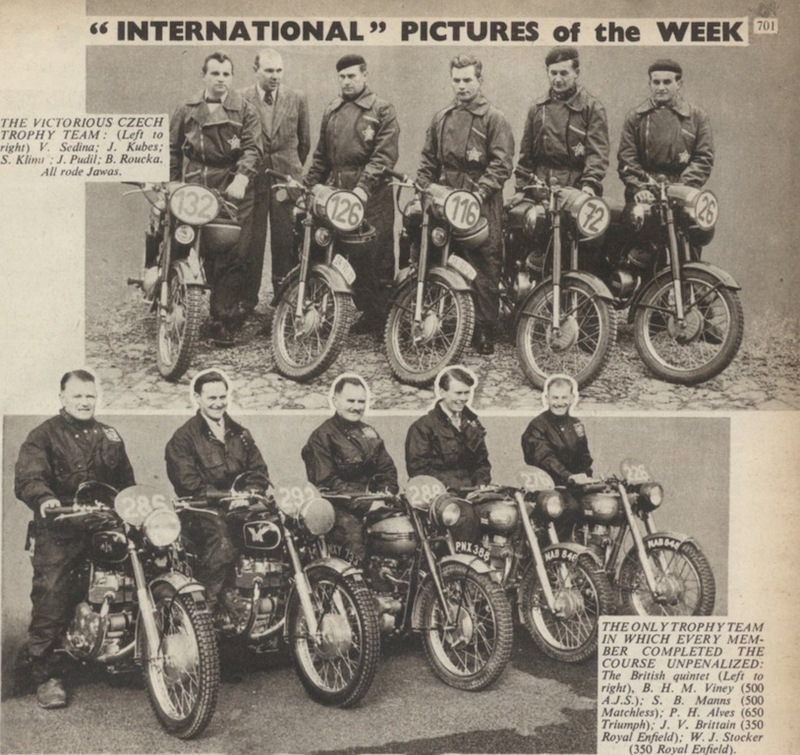 Below is a picture of the first and second team in the Trophy from Motor Cycling and below that is the text of the editorial that appeared in the post ISDT 1954 issue of Motor Cycling which explains the reason why British Riders and supporters were unhappy about the final result. Steve McQueen‘s ‘star’ shines as brightly as ever these days, and the man is still relevant some 30 years after he left us. You will see his image on the pages of glossy lifestyle magazines promoting sunglasses, wristwatches, jackets and motorcars. Steve’s fan base is global and we know this from experience: when great McQueen property is offered, the telephones light up from Japan to Australia, from Britain to the United States. While many of his contemporaries slip into obscurity, why does McQueen continue to hold our interest? Well, he starred in some of the most memorable movies of the Twentieth Century, he was an accomplished racecar driver, he was a great shot, he flew vintage aeroplanes, and he was also something of a hit with the ladies. 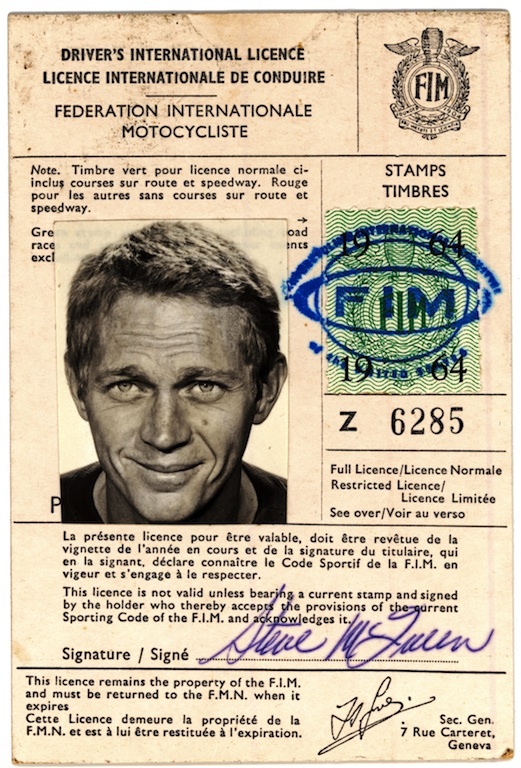 McQueen could ride a motorcycle too; in fact he was bloody good — so good that together with pals Bud and Dave Ekins, Cliff Coleman and John Steen he represented the United States of America at the 1964 International Six Day Trials (ISDT). the ISDT 1964 would take place in the Communist Eastern bloc during the height of the Cold War. On September 5, 1964 in a packed hall in Erfurt, East Germany complete with a large picture of Walter Ulbricht the then leader of the German Democratic Republic, McQueen — in what has been reported as one of the proudest moments of his life — carried the ‘Stars and Stripes’ for the US team at the opening ceremony. I’ve got a box full of my old outdated racing licenses probably worth a grand total of £0.00 but Steve’s license a folded piece of card the size of a cigarette packet, Steve’s sold for US$ 42,700 …. the price and value of fame eh! In the year where we see the celebration of the 100th anniversary of the very first ISDT. For many, especially in Wales, it is also going to be noted as the 80th anniversary of the fifteenth ISDT event which took place in Llandrindod Wells, Radnorshire, now Powys in 1933. We have a page dedicated to each year the ISDT took place but also its another anniversary as the ISDT changed its name in 1981 to the International Six Days Enduro (ISDE). In 1983, 30 years ago this year, the ISDE rolled back into Llandrindod Wells / Builth Wells, the last time the Six Day spectacular has occurred in Great Britain. During this year I hope to produce a page to commemorate the 1983 event, of which video clips of a Welsh Language TV Show on S4C can be viewed in our ISDT Tube page. Originally the awarding of the following years event was an honour bestowed on the National Governing Body for the country of the sport whose team won the trophy. However this became increasingly difficult because of the limited number of countries eligible to compete for the International Trophy, which could only be won by a team riding on motorcycles made in their own country. Later on the cost of this restriction limited the number of potential host nations and finding a host with adequate suitable terrain and resources became harder. The Trophy requirements were abandoned teams could ride on what they wanted, and it was later opened up to parties to bid for the rights to hold the event rather than winning the right. The history of the Welsh Events in 1933, 1937, 1938, 1949, 1950, 1954, 1961 can be followed on their own pages. As part of the 1933 celebration we have purchased an original copy of the ‘Motor Cycling‘ report on the week long event which we will be making available on the 1933 page. Below are a couple of images from that report and an extract from the editions forward piece on the ISDT of 1933. 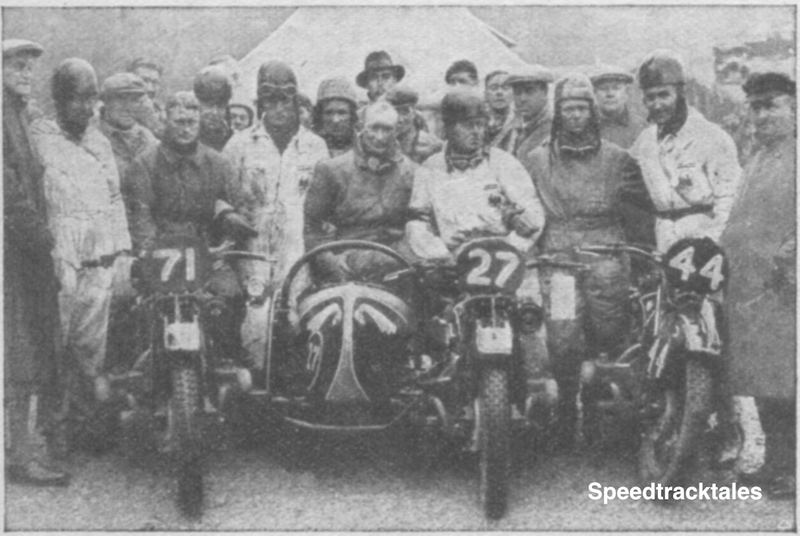 Back in 1933 the International Six Days Trial (ISDT) first visited Wales and in a report in the ‘Western Daily Press‘ of the event, the course was described as requiring competitors each day to ‘ride over the most difficult and dangerous roads in the British Isles‘ this was Britain between the wars with little need to travel to far off countries for excitement and adventure. The ISDT started in 1913 and much of its course followed tracks that in pictures appear they were made for farm carts yet, today, many of them are surfaced ‘A’ class roads. Yn ’sgyrion hollt â’i’m hesgyrn i. The fact was the nation’s road network had been a considered such a national disgrace in the 1800’s that it required a Parliamentary Commission to fix, this ultimately led to the decision when establishing the new County Councils in the mid 1800’s for them to take over managing main roads. By the 1927 Local Government Act, what roads were left being managed by the District and Parish Councils were passed over the the County Councils. This was at a time there was an increasing demand by the public for the metalling of highways with the increasingly popular Tar Macadam to provide a level all weather surface better suited to the needs of motor cars. Not a problem then worrying the ISDT organisers, who knew that many of the rural roads were still unmade and which, occaisionally, might only be treated to heaps of crushed rock to fill up holes to ensure the carts full of farmer’s turnips could be safely wheeled to market towns for sale. The roads of the early ISDT years were sufficient for their intended purpose to test motorcycle reliability. Although some private land was available for events, with heavy bikes with little or no suspension the public road network, as it was then, was more than adequate for the job. Local communities were also keen to see the event come though their area, both for the people it bought in and the distraction from the daily norm it gave to those in rural areas long before the distraction of TV or radio became popular social barbiturates.